2017 was incredible. It was tough as hell, but no year is absent of challenges. I love the process of reflecting on the highlights and what I’ve accomplished. I can see how far I’ve come and that gives me the courage to take risks, set bigger goals to improve my life and take steps to actualize them. Here’s to another magnificent year of struggles, achievements and unforgettable memories! Fostering and maintaining human relationships is hard and it doesn’t get easier as the time goes by. I met many wonderful people and deepened bonds with friends I’m already close with. Each bond I share with someone was purposeful. I surrounded myself around those who challenge me to push the limits of my potential. I worked hard to develop those relationships because they meant the most. And thanks to them, I’m the best version of myself today. 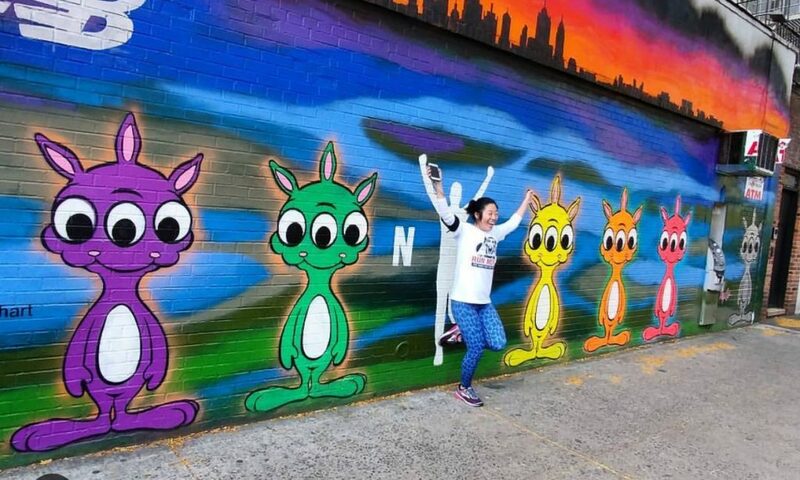 Finishing the NYC Marathon has been a major lifelong goal. I can’t express how amazing it feels to accomplish something I’ve been doubtful of doing. During training, I dealt with nagging injuries and unstable self-confidence. I secretly wanted the race to get cancelled. But I stuck with it, trained well and ran a phenomenal debut race. I hit all my goals, including those negative splits that got the reputation of being more negative than my attitude. I’ve admired Meb Keflezighi for a long time. I love his dedication to running and the depth of appreciation he has for his supporters. 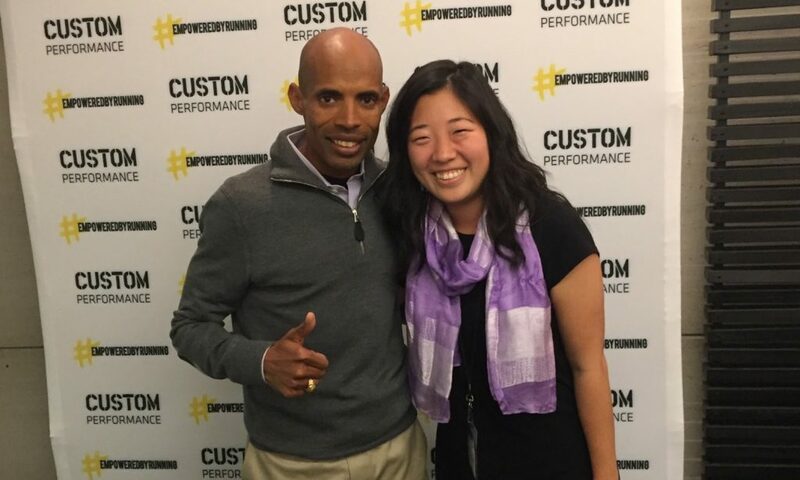 I’m honored to have met him and shared the stage for his final marathon as a professional and elite athlete. 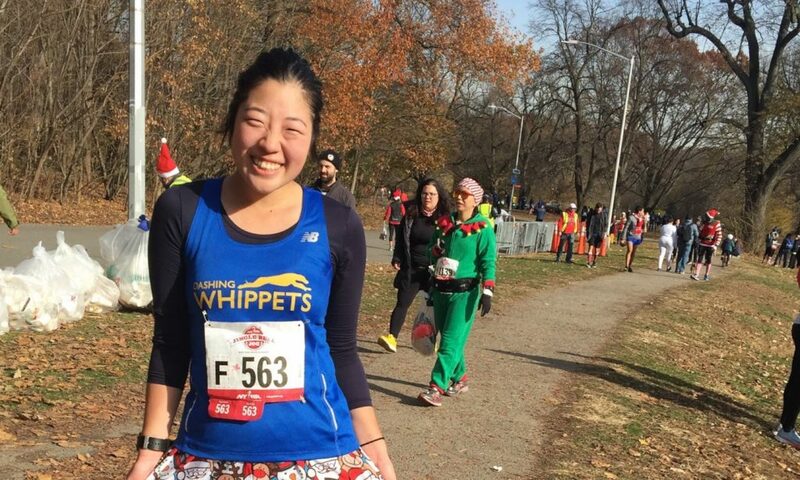 During the NYC Marathon, I ran by Kathrine Switzer towards the final miles and it was truly life-changing. 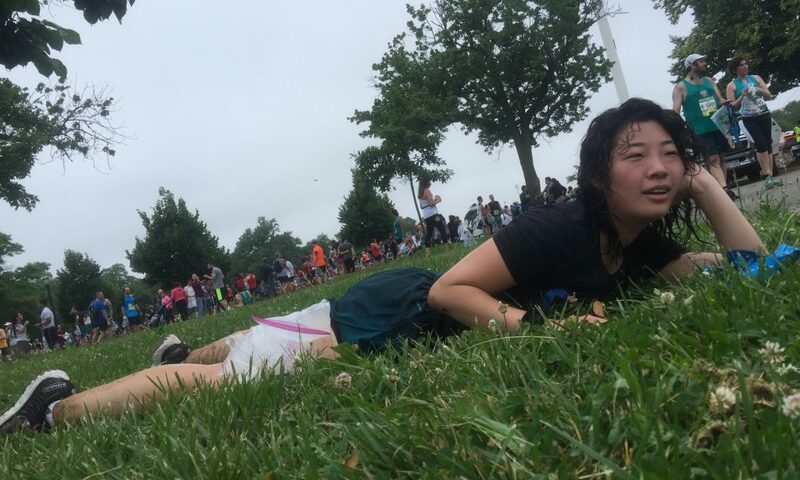 Being in her presence and knowing her courageous story gave me the determination to power through the finish! 2017 was my big running comeback. I hit all my goals. 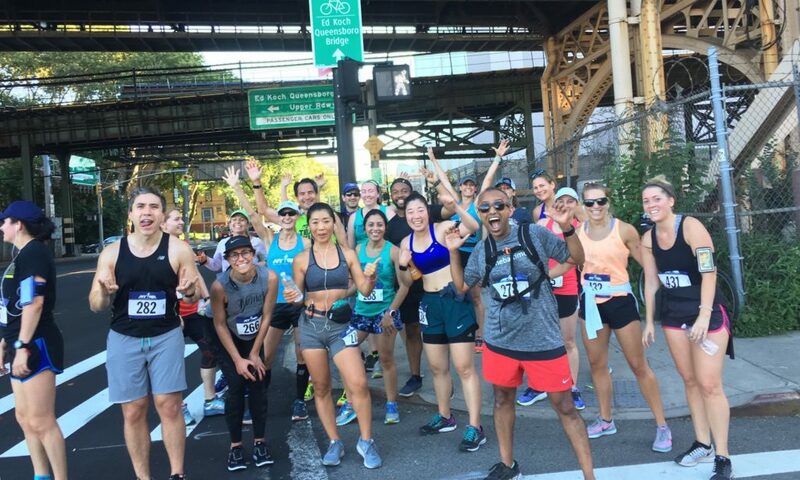 I completed the NYRR 5 borough series, qualified again for the NYC Marathon through the 9+1 program and ran a total of 25 races, with at least one in every month. I logged more than 1,000 miles for the year, trained through all four seasons, moved down from the H to E corral and broke the 2 hour half marathon. Most importantly, I had fun through the process and got comfortable in my runner’s body. I joined this team in August and this decision took my running to the next level. What I love about the Dashing Whippets is the diversity. Yet, despite our differences, everyone trains seriously and supports each other unconditionally. 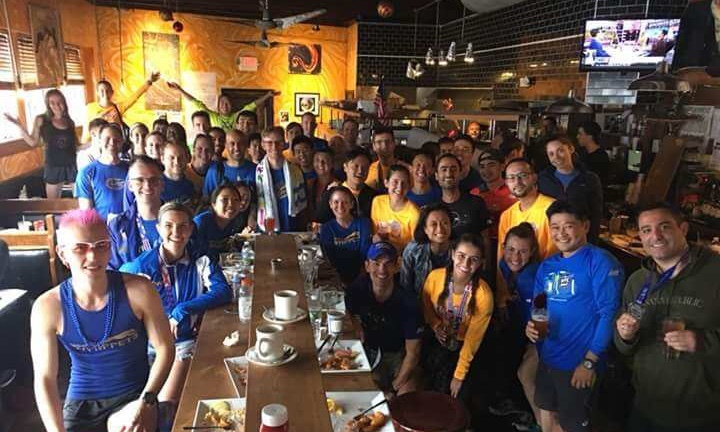 We know how hard we work to accomplish our goals so it’s especially meaningful when we can celebrate together. Being part of this team gives me the strength to set terrifying goals because I know they’ll push me to get them. 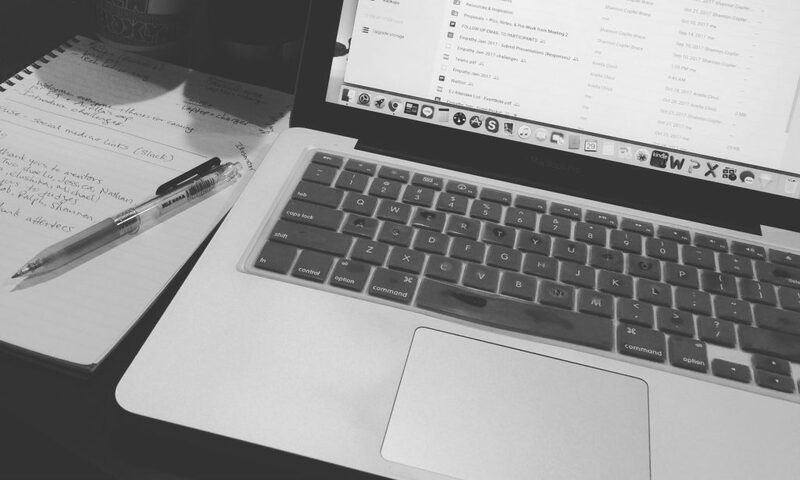 I love to write, but blogging on a consistent basis is challenging. I always have writer’s block and it’s mentally exhausting to motivate myself when I’m already physically tired from running so much. But writing keeps me sane. Writing allows me to have conversations about topics that invigorate me. Writing clears my mind and organizes my thoughts. I’m glad that I kept at it for another year and am excited to see where it takes me next year. 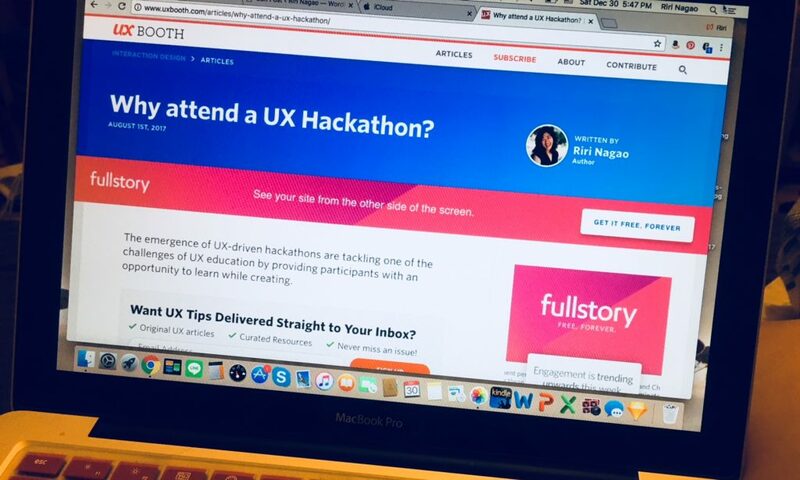 I wanted to test my confidence as a writer so I pitched an article on design and research-driven hackathons to UX Booth, one of my favorite online publications on user experience. 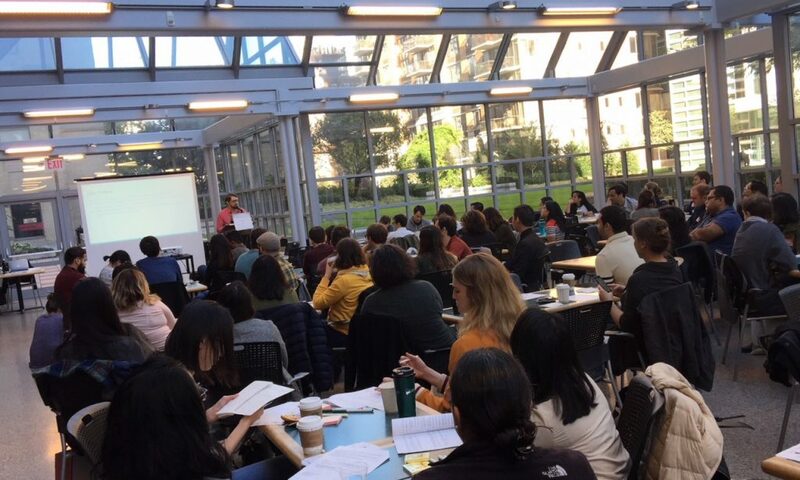 In August, I published “Why attend a UX hackathon?” and it was widely shared across various social media platforms. Getting published was the validation I needed to know that my writing and thoughts are worthy. But don’t settle yet, because this is just the beginning. 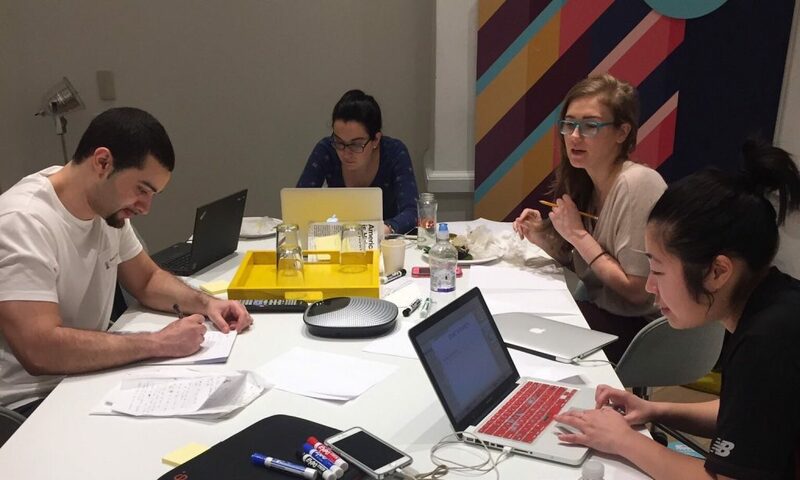 Following the UX Booth article, I got involved in producing the second Empathy Jam, a design hackathon. I went to the first one last year and absolutely loved it so it was really exciting to be on the other side and see what goes into planning a successful design event. It was a rewarding experience. I connected with many design professionals and expanded my own skills. The result was extraordinary and I’m thrilled with the turnout. 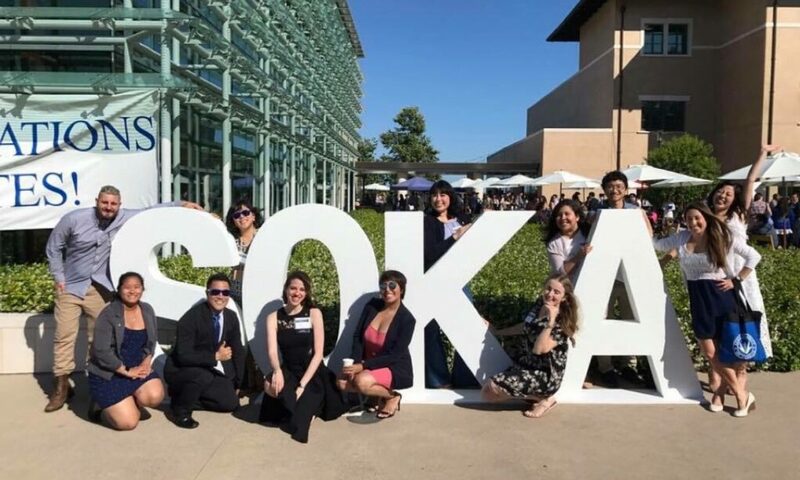 In May, I traveled to Southern California for the purpose of attending the Commencement Ceremony for Soka University of America’s Class of 2017 as an alumna. 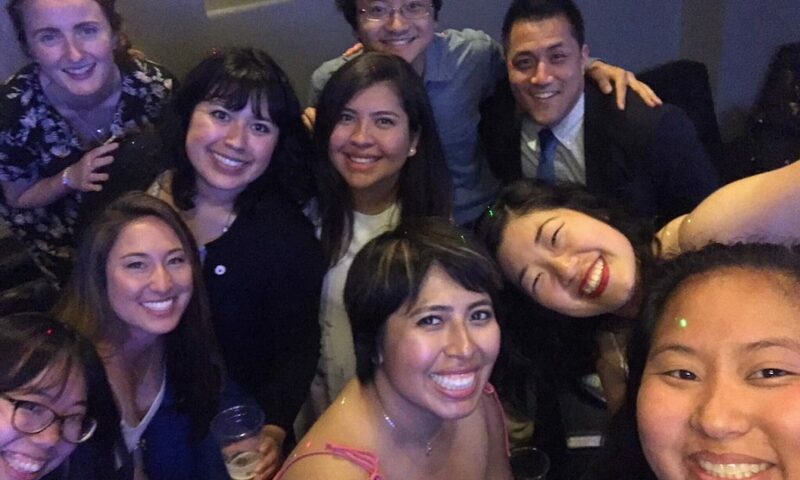 In addition, I celebrated 10 years of knowing my epic classmates. 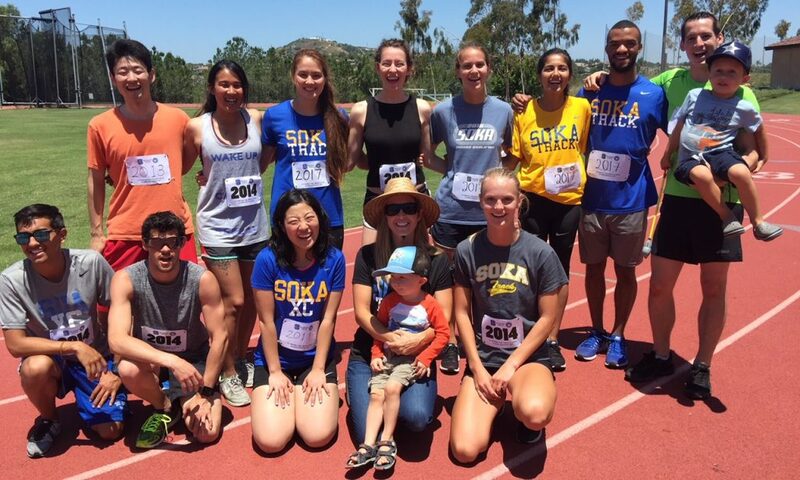 It was great to reconnect with them, along with alumni from other classes and reminisce about the good times “back in my day.” We also had a Track & Field alumni reunion and that was great. Plus, I got my In-N-Out fix! I’ve been to many wonderful weddings but being part of Yoko’s meant the most. She’s one of my closest friends from Japanese Weekend School and we’ve known each other since 1997 – 20 years of friendship! 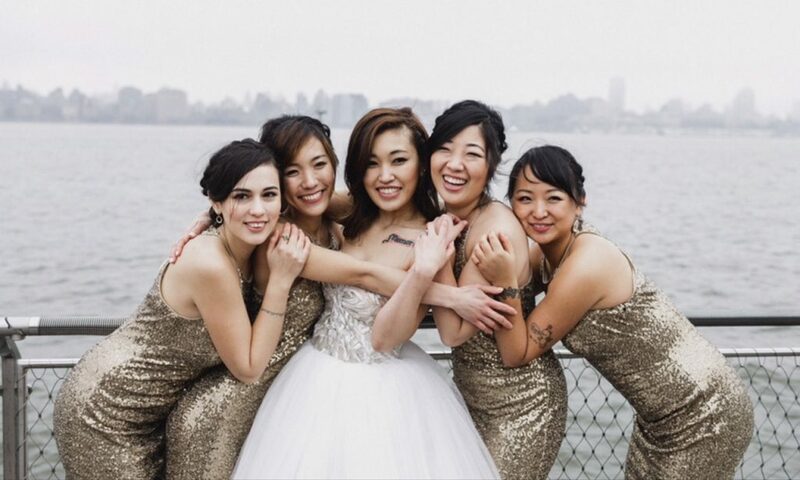 I was honored to be part of her special day in January as a bridesmaid, along with three amazing women. Knowing what she has been through, I was happy to be with her on this momentous occasion. It was truly an unforgettable day for everyone. Jimmy Kimmel is one of my favorite talk show hosts. In May, I sat in his audience for a taping in LA. 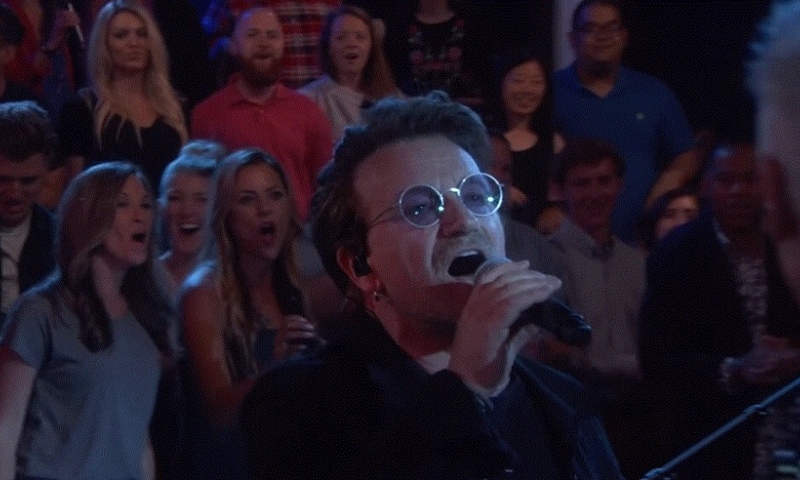 It was a treat to see U2 perform “I Still Haven’t Found What I’m Looking For” live in such an intimate setting. Plus, being two feet away from Guillermo was awesome! I managed to get tickets again to Kimmel in Brooklyn in October at BAM when the hilarious Howard Stern was the guest. Cardi B made an appearance and lit the place up. Both were amazing shows! When I completed my first design project last year, I knew I wanted to continue with UX. I took on another term with Beginex and worked on Frontier Health’s onboarding experience. I also initiated a UX research project for my law firm’s website. After the marathon, I was invited by the Dashing Whippets to help out with new member acquisition. I love taking on these projects and being trusted as a designer. The next step is making that transition into a full-time role. Failing scares me and I try to avoid it. But if I didn’t fail, I wouldn’t appreciate my accomplishments. I wouldn’t see where I need to improve. This year, I failed to hit certain goal times at races. I failed to make my career transition into a full-time UX role as I had hoped. I failed to finish paying off student loans, even though the end of 2017 was my goal. I failed to take care of myself sometimes, which is why I got injured. But I learned from all of them. Last but not least, 2017 was so much fun. I tried all kinds of fitness classes like kickboxing, crossfit, barre, spin and HIIT. I ran in a rainbow tutu. I saw Lady Gaga live. I discovered new places to eat in this wild city. I went to many design events and even met Jared Spool, a UX legend. I got a perm for the first time. I volunteered at several places. I read a few books and countless articles. I had many cups of tea and coffee and not enough whiskey. Last year was a major turning point because I stopped letting my environment influence my decisions (read: 2016 was a magnificent year). This year was special because I shattered lifelong doubts and bad habits and did things I never thought I could. Qualifying for the marathon and completing it wasn’t enough so now I’m chasing my BQ (Boston Qualifier). I’m pitching ideas for articles to publications with even bigger audiences. With my newfound confidence in UX, I’m applying to more roles (even if I’m not “qualified” on paper). There’s so much work to be done on my end. I’ll see you in 2018!